Kenwood TW-4000A dual-band transceiver provides versatility in VHF and UHF operation. 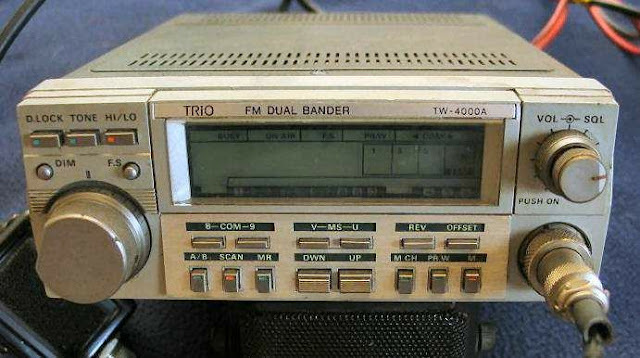 It offers 25 watts output on both the 2 meter and 70 cm (440 MHz) amateur bands. A low power setting of 5 watts may also be selected. Ten memories with offset recall and lithium battery backup are provided. A rugged die-cast chassis and heat sink provide RF shielding for improved mechanical strength and higher immunity to RF intereference. The backlit LCD display with S&RF bargraph can be easily read over a wide variety of lighting conditions. The key labels are also backlit. There are separate antenna output jacks on the back panel for 2 meters and 440 MHz. Supplied with 16 key DTMF hand mic [USA version], MB-11 mobile mounting bracket and DC power cord. Requires 13.8 VDC at 7.5 Amps. 6.375 x 2.375 x 8.675 inches 4.4 lbs.